Do you know the 1946 musical “The Harvey Girls?” It stars Judy Garland. In the film, she sings one of the most famous show tunes of all times “On the Atchison, Topeka and the Santa Fe.” The movie is about Harvey House restaurants, and the young women in their starched, white aprons and cuffs who went out west to feed hungry train travelers. "The train must be fed", they sang in the movie. In fact, millions of people needed to be fed and, wouldn’t you know it, we figured out how to do it fast right here in Kansas. Harvey House founder Fred Harvey had a nomadic and varied life before finally settling in Kansas. After immigrating to the U.S. from Liverpool in 1853, he started work as a pot scrubber in a New York restaurant. He worked his way to cook and would move on to New Orleans where he worked in the jewelry business before going to work for the Hannibal and St. Joseph Railroad. It’s that job that brought him to Leavenworth. Archiver historian Virgil Dean says Harvey opened his first restaurant in the Topeka train depot in 1876 then spread his Harvey Houses from there. By the time Harvey died in 1901, there were 47 restaurants and 15 hotels in the chain all excellent food served by well trained and pretty Harvey Girls. “Prior to this time there were very few places that people could get that kind of meal for a reasonable price in a short time,” Virgil says. The Harvey Girls became famous and celebrated. “These girls were hired because of their attractiveness, their maturity and their ability to work hard,” Virgil says. As train travel gave way to highways and cars, Harvey Houses faded away, although a few survived into the 1960s. But people wanted even faster food, and a couple of guys in Wichita figure out how to do that. 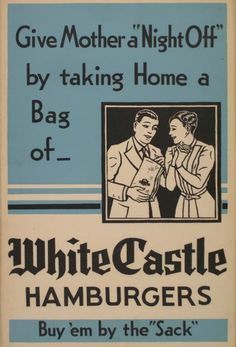 White Castle hamburgers were invented at 1st and Main in downtown Wichita in 1921. They were the brainchild of diner owner Walt Anderson and insurance man Billy Ingram. White Castle, with its pure white exterior and stainless steel interior, reopened the market to ground beef. People were scared to eat it after the Upton Sinclair novel “The Jungle” came out in 1906. The book unearthed the unsanitary conditions in meat packing plants. The chain quickly spread, opening its second store in El Dorado in 1922, moving out of Kansas into Indiana in 1927 and entering the movies in 2004 with Harold and Kumar Go To White Castle. If Harold and Kumar got the munchies in central Kansas, they would've ended up at the Cozy Inn in downtown Salina. You’re not a real Kansan unless you’ve had sliders at the Cozy’s. But which came first, White Castle or Cozy’s? Naturally, we turned to Archiver historian Virgil Dean. “According to their own history, Cozy followed White Castle by a year. But their inspiration for the slider type hamburger with no frills, and very little meat, was the White Castle restaurant which started in Wichita,” says Virgil. But Kansas wasn’t nearly done with fast food. And the next restaurant concept was even bigger. Pizza Hut we founded in Wichita in 1958 by brothers Dan and Frank Carney, who borrowed $600 from their mom to open the first store. In 1965, they aired their first TV ad in Wichita. It has a kind of Keystone Cops feel. A guy orders a pizza on the phone and then races to Pizza Hut in a tiny kid's Mustang convertible chased by his neighbors. Clearly, the ad has nothing to do with pizza and everything to do with the convenience of take out. The bothers Carney sold the business to Pepsi in 1977 and Pizza Hut is now owned by Yum Brands, based in China. Pizza Hut can still be big news in Wichita. In September the original building was moved onto the Wichita State campus where it will house Pizza Hut memorabilia. Sure fast food having its root in Kansas is fun, damn fun. But what did we turn loose on America? To help us figure that out, we went to Elizabeth Burger. “Just like a hamburger without the ham,” she says. Burger is a senior program officer at the Sunflower Foundation in Topeka. Her job takes her all over Kansas, overseeing programs for healthy eating and active lifestyles. Much of that environment is dominated by commercials for fast food and surgery drinks. Billions a year are spent by food companies. But Elizabeth is not a total fast food buzz killer. The key, like with anything, is moderation. So, our fast food journey through Kansas starts on the Atchison, Topeka and Santa Fe with Judy Garland and ends with, well, a bit of a lecture on our eating habits. But we think, we might all be craving a Cozy’s slider right about now. Our theme music is used in this episode is Shy Touches by Nameless Dancers. Other music used in this episode is The Big Ten, and Sunday Lights, by Blue Dot Sessions; both have been edited.